Many people often upload gameplay screencasts on YouTube and share video game recordings with friends. If you want to show off your video games success, check our list of most popular free game recorders, here we have introduced 10 best free game recording software and Apps to help you find an ideal fit for your specific needs. If you are looking for some game recorder is worth paying for, take a look at our full guide to best free and paid game recorder . OBS is an advanced open source type software tool that assists users in screen recording over Windows platform. It offers all facilities for free where you can enjoy video recording as well as live streaming at the same time. Although this software program is designed to assists users on Linux, Mac as well as on Window platform but professionals use to recommend it for the window users so commonly. OBS possess so many advanced filters and effects that help in customized video creation whereas the color keying, color correction and image masking facilities are always top ranked. Read our full review of OBS . 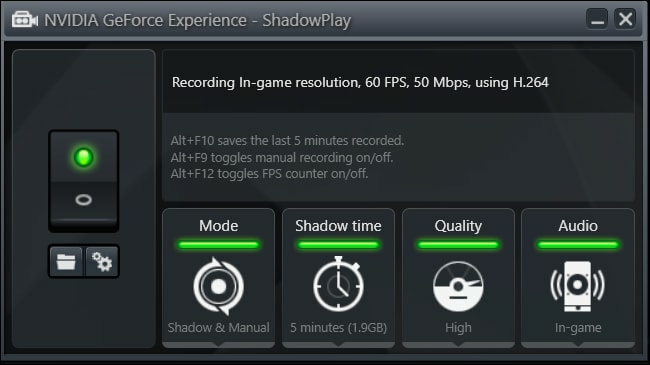 The ShadowPlay software program is designed with so many advanced features and it is believed to serve game lovers with lots of features. Presently this tool is rated higher among all competing game play recorders due to its dramatically more impressive performance even on heavy game platforms. Outputs are usually generated at 1080p resolution with 50Mbps speed. The best thing to know is that this software is available for free but you need to spend on GTX 650 or a system with much better graphics that can handle this powerful software tool. It is very simple yet powerful game recording software tool that also offers live streaming facility. Xsplit Broadcaster is simply the best choice of all game lovers as it can develop rich video content for all your favorite games. You will be glad to know that this software extends its support to almost all capture cards so that you can have trouble free video recording. It is possible to generate videos with advanced integrations and custom plugins whereas edit and upload facilities are more users friendly. The followers and chat notifications stay active on this platform so that you can have all details about your live streamed videos whereas quality can be improved to much better level with the professional production features. Step 1. Simply right click on the white area available in scenes and then select add scene option, rename it with name of your game. Step 2. Now start your game. Step 3. 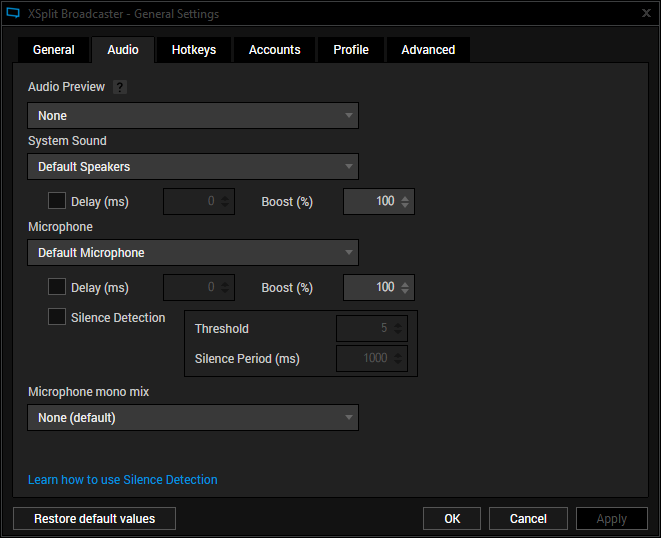 Again right click on the sources and then select game capture option, you can make settings for full window capture or customized recording. Step 4. Finally start the recording of your game play. It is recommended to use QuickTime player to control and record all game play activities on your screen. The best thing to know is that it is capable enough to capture the whole screen as well as can record some scenes from specific parts of screen. Users can add audio narrations to video files by simply connecting external microphone. Some of the advanced controls of this software program are the playback controls like adjust volume, fast forward, rewind, pause and play etc. It is possible to record games on iPod, iPad as well as iPhone like devices. If we talk about editing controls then you will love to use flip, rotate, delete, paste, copy, cut, split and trim etc facilities. The professionals at QuickTime player or recorder community offers quick support to all queries so that game lovers can enjoy innovative recording features without any trouble. Debut is capable enough to record videos from your computer screen, from VHS tapes as well as from webcam directly. Users can enjoy various pre-production features on this recording platform like output file format settings, resolution enhancement or video colour adjustment etc. It is good to download Debut as soon as possible and enjoy your game recording hobbies while building an impressive content library over this software platform. It extends support to almost all popular file formats like Mov, MP4, MPG, FLV, WMV and AVI etc. In order to highlight certain specific portions of your videos, you can make use of mouse. Video overlays are also available on this software whereas videos can be directly burnt to DVD. Game lovers often love to add captions to their recorded videos and Debut assist to enjoy this feature with easy time stamp function and fast text caption editing. Those who want to enjoy time lapse videos can also make easy settings from user interface terminal. Step 1. Go to software window and then from file option, choose New Movie Recording. Step 2. In order to adjust the recording settings for your game play you need to move to the arrow that is available next to the record button and then from drop down menu you can make easy selections for recording quality, microphone connectivity and iOS device selection. Step 3. If you want to adjust the audio level for narration then use volume slider available on screen. Step 4. Hit the record button to initiate recording process. In case if you want to edit your videos to generate some customized effects then there are several options available as like trim, rotate, flip or cut etc. Once completed then feel free to share your video on social media websites. You will be glad to know that this is a jailbreak free recording application for all iOS users and possesses all incredible features. As Apple use to follow very strict instructions regarding screen recording software programs in sake of security issues so users cannot avail this application directly from App store. Rather you need to visit Emu4iOS.net to get access to your Airshou application. It will take very less time to get installed and then serves with all amazing features for game recording. Users can enjoy game play recording over iPhone while using multiple orientations and audios can be directly sent from microphone. It is much easier to adjust audio quality and resolution of videos so that highly impressive results can be obtained. Step 1:Go to safari and then search for Emu4iOS.net. Step 2: Simply click on the Get button to install AirShou and then open it. Step 3: Now select the record option from your device screen, follow few setting adjustment as per your recording need and then hit Next step button. Step 4: You need to swipe in upward direction to hit the AirPlay Mirroring function, within very less time the recording will begin. Step 5: Now you can start playing your game and it will be recorded by the software till the time you press stop button. Google Play Games is rated as one of the best program to enjoy gaming profile with active recording facilities. The screen recording feature in built in to this software and it can be used with games as well as on other screen tasks. It provides stunning videos for all recorded videos and users prefer to generate game tutorials using this application on their android devices. The sad part is that it can record videos with 720 p capabilities at max whereas one lower level setting is available for 480p. You need not to pay to get this software on your device as it is available for free to all game lovers. This application is often used by beginners as it offers very simple control options along with easy editing facilities. If we keep the video quality on one side then all other features of this application are good enough to enjoy game recording on android devices. This application is available for free as well as can be obtained with fully featured configuration by paying $3.00 only. It works perfectly for all heavy and light games and users can enjoy easy controls for start and stop during recording process. The best part is that it never forces users to limited their recording with time durations, it never even have advertisements and you will never face watermark issues with this game. It is also possible to pause recording as per need. You will always be able to enjoy crystal clear recording with this application so it is good to go ahead with its free version first to learn the basic controls and then go for paid one. You need to have android 5.0 or above that to have perfect compatibility with this application. Here is a premier game recorder software program for you that can capture the game as well as screen. The best thing to know about this recorder is that it automatically recognizes the game on your android device and then immediately starts recording process. It never demands root access to lollipop so you can always stay safe and secure. It is possible to start, pause and stop recording with intuitive control options that can be accessed by professionals as well as beginners with ease. Most of users love to create customized game videos with this application just to impress then competitors in gaming world. You can get this application for free from official website. Once you have created your game tutorials then you can easily share them on YouTube or other social media platforms as per need. Step 1: First of all you need to launch the AZ Screen Recorder application on your mobile from app drawer. Step 2: Once your application is open then you will soon find an overlay on your screen that possess four different buttons. 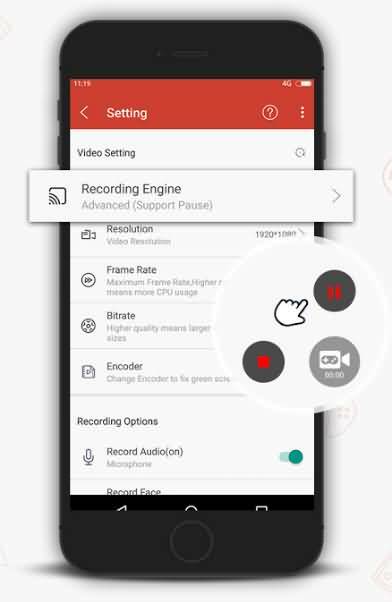 It is time to tap gear icon just to tweak the settings for video recording; it will help you to make settings for bit rate, frame rate and resolution etc. Once you have adjusted all these settings then hit the back button and you will be back on home screen. Step 3: Now open your game that you want to record with this software or if you want make tutorial for any other application then you have to open that on your device. Step 4: As soon as your game is started then hit the icon indicating red camera shutter on AZ overlay. It will initiate the recording process on your device screen. Now you can use your phone the way you want. Step 5: Once your recording task is finishes then simply pull down your notification window. At this interface you will find two controls for your AZ screen recorder. Now you can either pause your recording process or stop it as per need. It is also possible to customize videos with some active controls like cut, trim, crop, convert and replace etc. The GIF file format is gaining more and more popularity these days as it can be used to display few basic game hacks. AZ Screen recorder helps users to design game tutorials with proper captions and time settings.